‘For it is evident that my religion is a poet’s religion, and neither that of an orthodox man of piety nor that of a theologian. Its touch comes to me through the unseen and trackless channel as does the inspiration of my songs. My religious life has followed the same mysterious line of growth as has my poetical life. Somehow they are wedded to each other and, though their betrothal had a long period of ceremony, it was kept secret from me’. ~ Rabindranath Tagore in the chapter ‘The Vision’ in The Religion of Man. ‘My religion is my life ~ it is growing with my growth ~it has never been grafted on me from outside.’ ~ Tagore to Robert Bridges, 8 July 1914. ‘Temples and mosques obstruct thy path, / and I fail to hear thy call or to move, /when the teachers and priests angrily crowd round me’. (A Baul song which impressed Tagore and was cited by him in the chapter ‘The Man of my Heart’ in The Religion of Man). ‘The Idea of freedom to which India aspired was based upon realization of spiritual unity…India’s great achievement, which is still stored deep within her heart, is waiting to unite within itself Hindu, Moslem, Buddhist and Christian, not by force, not by the apathy of resignation, but in the harmony of active cooperation.’ ~ Tagore in Berlin, 1921. ‘Patriotism cannot be our final spiritual shelter; my refuge is humanity. I will not buy glass for the price of diamonds, and I will never allow patriotism to triumph over humanity as long as I live.’ ~ Tagore to Aurobindo Mohan Bose on 19 November 1908. ‘Therefore it is said in the Upanishads that advaitam is anantam ~ the One is Infinite; that the advaitam is anandam ~ the One is Love’. To give perfect expression to the One, the Infinite, through the harmony of the many; to the One, the Love, through the sacrifice of self, is the object alike of our individual life and our society.’ ~ Tagore in Creative Unity. In his work The Religion of Man ~ the Hibbert Lectures for 1930, published in 1931 ~ Tagore compiled his views on religion and philosophy of life. The compilation was by and large based on the Hibbert lectures Tagore delivered at the University of Oxford in 1930. Given the mad frenzy, hypersensitivity and occasional vindication of ruthless violence in the name of religion in our contemporary world, the prophetic vision of Tagore, (as revealed in his writings and biography) has never been more relevant in modern times. Tagore’s realizations and observations not only open a spiritual window for seekers of individual salvation, but also serve as a panacea to safeguard all individual faiths from being entrapped within parochial perceptions, inane rituals and radical exploitations. In fact, Tagore’s lectures and other observations on religion invite his readers to transcend the narrow barriers of conventional faith, thus paving the way for a larger form of internationalism, peaceful co-existence and universal brotherhood. At the outset, however, in tune with Tagore’s thoughts, it is imperative to capture the right principle behind following any particular faith. 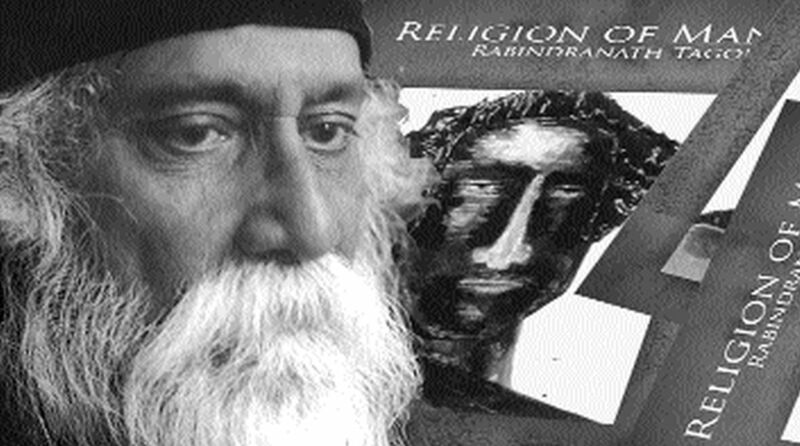 In most of his presentations at Oxford, Tagore intended to capture ‘the true spirit of religion’: ‘In them you will see discussed what I consider the true spirit of religion, about my idea of all different religions, what they mean.’ Almost nine decades after his observations were made, even today Tagore’s observations are not only relevant for his countrymen, but for the entire world at large. Tagore’s journey as a poet was deeply interlinked with mystical moments of epiphany, which as he proclaimed later, often led to sudden flashes of mystical illumination. He particularly recounts one of his epiphanic moments in his late teens, when the rays of the early dawn sunlight evoked ‘an inner radiance of joy’ in his mind. Akin to the British Romantic poet William Wordsworth, Tagore’s pantheism or mystical awakening was often refracted through the world of nature. Unlike Wordsworth, however, Tagore articulates his moments of epiphany in considerable detail. An instance may be cited from his reminiscence recounted in the chapter entitled ‘The Vision’ from The Religion of Man ~ ‘The ordinary work of my morning had come to its close, and before going to take my bath I stood for a moment at my window, overlooking a market-place on the bank of a dry river bed, welcoming the first flood of rain along its channel. Suddenly I became conscious of a stirring of soul within me.